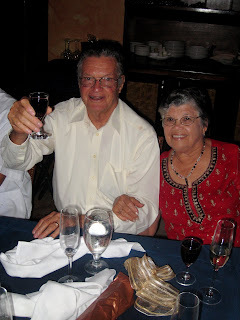 Vernon and Francine are celebrating their 57th wedding anniversary in two weeks time. As I write this they are both in London, visiting my sister, her daughter and her grand-daughter. My parents have three great-grandaughters and one great-grandson. They have three children, and eight grand-children...we have a lot of family get-togethers! Vernon has not been well, and everybody is looking forward to them coming home. He doesn't do a lot of wedding ceremonies anymore, but he has been known to do special requests. Many years ago, Fodor's described him as "a gentle, warm-hearted man". We agree with them. He wrote all our wedding ceremonies, and we are still using them...they bring tears of joy to many brides when they hear those beautiful, heart-felt words of love and commitment. All our ceremonies begin with the words " We are gathered here, where the sun meets the sky, the sky meets the water, and the water meets the land to mark the outward symbol of an inward union of hearts...a union created by love, commitment, respect and trust..." You might want to change the words around, but in Vernon's book these words are the foundation for a happy marriage and he and Francine have the experience to prove it. 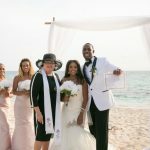 This year marks 25 years of business for Cayman Weddings, what began as a retirement hobby for Francine and Vernon has become a Cayman Islands institution. 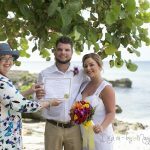 They created the very first wedding planning and marriage officer business, and Cayman Weddings is still the company of choice for residents and visitors. 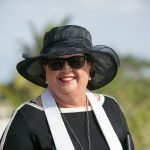 It is still completely a family owned and run Caymanian business with a reputation for integrity and professionalism. 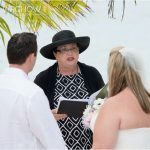 From all of us, Gampie and Gamie, especially your eight grand-children who all worked at Cayman Weddings through high-school and college, and who can all put "assistant manager" on their resumes, happy, happy anniversary...we love you very much!